System Protection has been supporting various projects by renting out wide variety of highly reputed and branded Testing Equipments as per clients requirements. Our Equipments are calibrated and maintained as per manufacturers recommendations. Hiring / Rental of Test Equipments like : Omicron CMC 356, ISA T1000+, HISAC Ultima, VIDAR, SA 30i, Tan Delta Test Set, etc. 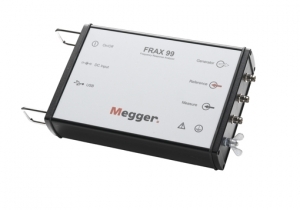 The FRAX series of sweep frequency response analyzers (SFRA) detects mechanical and electrical changes of the core and winding assembly of power transformers. The CMC 356 is the universal solution for testing all generations and types of protection relays. Its powerful six current sources (three-phase mode: up to 64 A / 860 VA per channel) with a great dynamic range, make the unit capable of testing even high burden electromechanical relays with very high power demands. The CMC 356 is the first choice for applications requiring the highest versatility, amplitude and power. Commissioning engineers will particularly appreciate its ability to perform wiring and plausibility checks of current transformers, by using primary injection of high currents from the test set. SCOPE introduces its next generation of hugely popular CRM series contact resistance meters, CRM 100B+ in all new super light avatars, based on cutting edge ultra capacitor technology. CRM incorporates some state of the art hardware & smart software features making it a must have tool for testing & maintenance engineers. CRM directly measures micro-ohm values at 100 Amps DC under live EHV switchyard conditions quickly & accurately. CRM is specially designed to reliably measure micro-ohm contact resistances of circuit breakers,isolators, busbar joints, earth switch joints, welded joints etc., under the hostile electrostatic noise found in live EHV switchyards up-to 765 kV. SCOPE’s ability to make electronics work in such environment enables CRM to measure millivolts signal in the presence of kilovolts noise. CRM is equally suitable for MV / HV / EHV equipments and is very useful to Power Companies, Equipment Manufacturers, Testing & Commissioning Companies and Test Laboratories, etc. 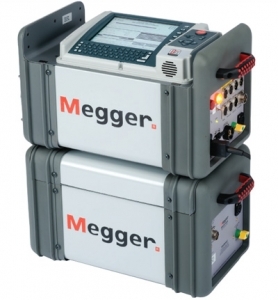 Two models CRM 100B+ having in-built 100A current source respectively make use of innovative technology that makes them the lightest 100 Amps micro-ohm meter available. When a vacuum circuit breaker is commissioned or undergoes routine tests, it is very important to be able to ascertain whether or not the Vacuum Interrupter (VI) is intact before putting it back into operation. VIDAR enables you to check the integrity of the vacuum interrupter quickly and conveniently by means of the known relationship between the flashover voltage and the vacuum interrupter. A suitable test voltage (DC) is applied to the breaker, and the result is known immediately. 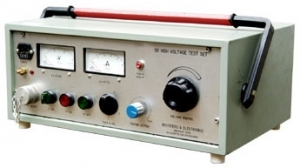 VIDAR permits you to select among test voltages from 10 to 60 kV DC. One of these voltages is customized and specified by the customer when ordering. A green lamp indicates approval of the VI. A red lamp indicates that it is defective. Two-hand control and a high-voltage warning lamp enhances safety. VIDAR has been developed in close collaboration with leading manufacturers of vacuum circuit breakers. It weighs only about 6 kg (15 lbs), and it is easy to use since interrupters do not have to be dismounted for testing. 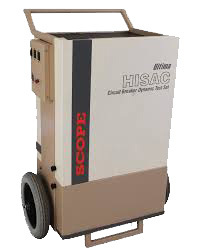 VIDAR is therefore ideal for use in the field or shop floor applications. 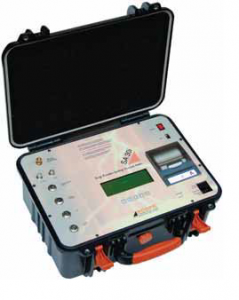 SA 30i the leakage current meter from SCOPE is a State of the Art on-line test system for Residual Life Assessment of Surge Arresters. 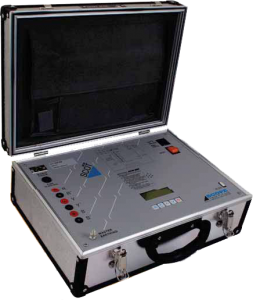 The instrument measures and directly displays the values of resistive and total leakage current. The SA 30i can be pre-loaded with the identity (LA Identification, Type, Serial Number, Location, Rated Voltage etc.) and tests conducted on the same ID of the Arresters are saved under its own folder. A trend analysis software, SAdata picks up this data and files them in a similar fashion on a PC. This analysis software enables the user to take a decision to repair/replace the arresters considering safety limits. SA 30i is designed to work under the hostile electrostatic noise found in live EHV switch yards. The instrument contains three separate generators: 1) Main generator, that generates either AC current, AC voltage; DC voltage; 2) Auxiliary AC voltage generator, that generates an independent, phase shiftable AC voltage; 3) Auxiliary DC voltage generator, that generates the DC voltage that powers the relay under test. 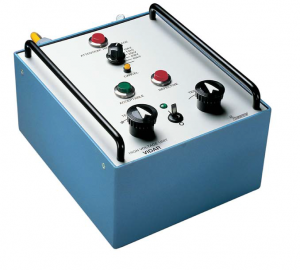 All outputs are adjustable and metered at the same time on the large, graphic LCD display. T 1000 PLUS can operate without connection to a PC. 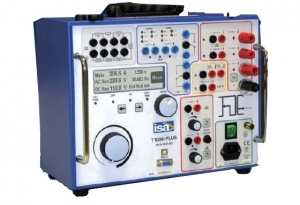 With the multi-purpose knob and the LCD display it is possible to enter the MENU mode, that allows to set many functions, that make T 1000 PLUS a very powerful testing device, with manual and semi-automatic testing capabilities, and with the possibility to transfer test results to a PC via USB or RS232 interface. These results can be recorded, displayed and analysed by the powerful TDMS software, that operates with all WINDOWS versions, starting from WINDOWS 98 included. Millennium versions of SCOT Series of time interval Meters from SCOPE are compact and reliable instruments to measure operation times of all times of HV and EHV circuit breakers under charged switchyard conditions. Time interval Meter measures and displays CLOSE, OPEN and C-O times of main contacts of 3 poles connected end to end simultaneously. Measures instantaneous / average / min / max for voltage, current, active / reactive / apparent power, PF (cosfi) and line frequency all on one screen. The recording time for these parameters can be set from 1 second up to 2 hours in several steps. Trend of all main parameters and customized Zoom functions. Function to define size of capacitor banks of PF correction unit. Portable DC High Voltage Test Set is used for testing underground cable for knowing the condition of cable-leakage at High Voltage. The units are supplied with 5 meter long input and 5 meter long output lead with sockets & clips. The unit comes with digital meters for easy readability with test terminal for zero error. The Ultimate solution for testing Circuit Breakers of all types. The Ultima is most complete analyzer for checking the dynamic performance of CBs in live EHV switchyards.